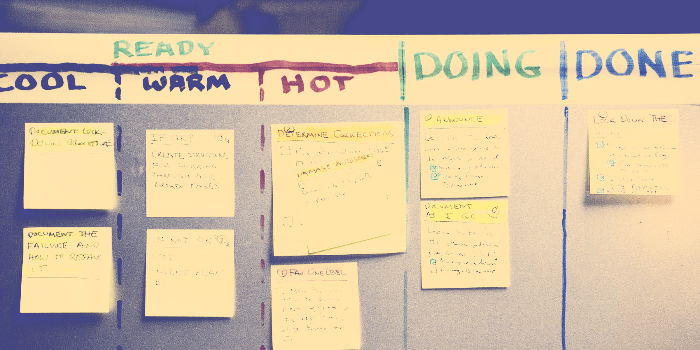 Jim Benson, perceived as the father of Personal Kanban, has written a blog post about creating your first Kanban board for personal purposes. Read on, to learn how to set up a Personal Kanban board tailored to your particular needs in just 3 simple steps. To prepare a suitable Kanban board you first need to appreciate the way you work and to know your own requirements. The start of all workflows is a backlog - the column, where all tasks begin their journey through the board. Once you know what there is to be done, you can set up the next column - Doing - into which you'll pull the tasks that you're ready for. The last column of a basic board contains the completed items (useful as a reference or an archive). A Personal Kanban board can be set up anywhere, even on a sheet of paper, but a whiteboard is preferable, as it will accommodate any changes that you'll be wanting to make as you understand your process better. Adding a new stage to the process will be much easier that way. In order for your Personal Kanban to work, you should really collect absolutely every task you can think of in the Backlog. However big or small, put it all there. Once you get through your initial load you'll know the satisfaction that comes from making a real progress! The idea behind putting a limitation on the number of things that you can do at one time is to basically ease your mind and get some things done. It's easy to make a start on any number of jobs, the difficulty tends to lay in completing them. So, by limiting work in progress to a small number, you'll get forced to finish some tasks before you're able to begin working on another, therefore the overall number of things that you finish will increase. Get started now, Personal Kanban is as simple as that!